Master Plastics offer Solid Vinyl Skirting which is backed by a lifetime non-prorated warranty. Solid Vinyl Skirting is available in white, beige or sand colours. 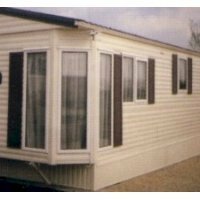 Description: Caravan Siding Kit, will fit any caravan up to 37ft x 12ft Fascias.com is now able off.. Description: Interlocking cream tongue and grove cladding fixes into an edge trim, idea for creatin..